Last month, on the streets of Otavolo, Ecuador, around three thousand peaceful marchers participated with the Confederation of Indigenous Nationalities of Ecuador (CONAIE) in protest of the Summit of the Bolivarian Alternative of the Americas (ALBA). With eight presidents of the countries involved at ALBA, CONAIE tried to deliver a communiqué asking why they weren’t invited to participate on behalf of the indigenous tribes. More importantly, CONAIE’s demonstration was to focus on the government’s approach to neoliberal policies that only enriches themselves and foreign companies while impoverishing others. The CONAIE, like many other indigenous tribes protecting their lives and Pachamama (Mother Earth), protest against one of their most difficult opponents—global production. To counter the Ecuadorian government’s unfriendly policies, CONAIE demands to be recognized as a sixth level of government. They want the ability to debate and veto the neoliberal business decisions that are aimed at damaging their territory. These damages are done by the government’s allowance of Canadian mining companies coming into indigenous areas to exploit minerals on a large-scale (a gigantic open-pit copper mine), privatize water (forty-five percent of Ecuador’s water is under private control) and oil extraction in the Amazon. This would further displace communities, bring about deforestation, dry up or contaminate rivers, destroy the pristine landbase they’re dependent on and deteriorate the health of those living in the area. In ongoing attempts to demonize CONAIE, the group and its members have been falsely marked as “terrorists” by Ecuador’s four-year President Rafael Correa on suspicion of trying to overthrow the government. A recent case of this supposed “terrorist” activity involved people breaking “through a police line” while marching at the ALBA summit and “allegedly” taking “a pair of handcuffs.” Somehow the theft and destruction of land and killings of indigenous people by the government doesn’t make it into this reality. Without warning and unprovoked, the gunmen used pepper spray and then fired their weapons at the defenseless villagers. 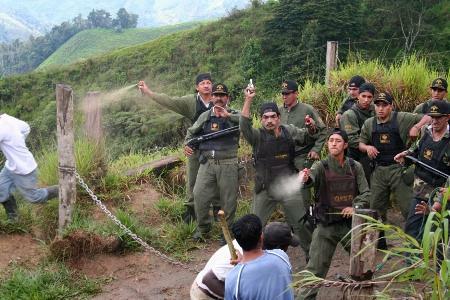 Although villagers were injured, they did not back down from the violent attacks. The thugs, stunned by the villager’s defiance, instead retreated themselves. Afterwards, 56 of the gunmen were held under citizen’s arrest until local authorities arrived. This eventually led to a peaceful takeover of the paramilitary’s camp in Chalguayacu Bajo and permanently stopped Copper Mesa Mining concessions. However, events like this have altered how President Correa politically and strategically approaches the CONAIE and the indigenous tribes that are aligned with them. Correa excludes CONAIE and indigenous communities from constitutional state rights (contrary to the UN Declaration on the Rights of Indigenous Peoples, Correa doesn’t acknowledge CONAIE demands), and recently approved the New Ecuadorian Mining Law that lifted a ban on mining and labeled members from CONAIE as terrorist. This not only gives the government more excuses to arrest and prosecute, but to employ the use of lethal force. In response to Correa’s tactics Marlon Santi who heads CONAIE remains optimistic and says that the movement will not become violent. CONAIE continues collective leadership instead of caudillismo (big man leadership), garners media attention to support their progressive protests and involves indigenous people, teachers, students, leftist and socialist movements. While only making up twenty percent of the population, indigenous people are the ones that President Correa should be representing, not the business elite who are the source of their corruption and deterioration. The structure that traditional indigenous tribes march for will help save Ecuador from becoming another country that cannibalizes itself in the name of economic prestige.